“There ARE too many migrants”, “Halt the asylum tide now!”, “Migrants: How many more can we take?” -- all of these were splashed on the front pages of The Sun and the Daily Mail in the lead up to the vote. And now “Go back to Africa!” is being yelled at minorities in our communities after the ballots were counted. But none of this represents who we are as a people, no matter how we voted. These media outlets have mainstreamed racism and hate in the UK. Because of their irresponsible coverage the racist minority in the UK now feels emboldened. It’s why in the days since the referendum result, there’s been a 57% rise in reports of hate crimes. The media started this, and now they can end it by holding those responsible to account, and reminding the country that racism has no popular place here. We are less divided than we imagine, the UK is still a place that values community, connection, and humanity. 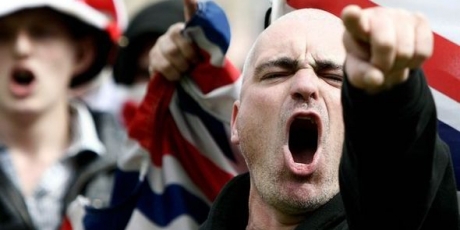 Britain’s far-right extremists and the media that echoes their hate are using the Brexit vote as proof that half the country agrees with their racism -- and it’s causing a terrifying rise in harassment across the country. Great news! Over 93,000 of us have joined, sign and share now -- let’s get to 100,000 and demand editors that fan hate are removed. “No More Polish Vermin" -- that's what was posted through the letterboxes of many Polish families this weekend. Hundreds of racist incidents have been reported, and there is one way we can help stop them spreading. Far-right radicals and neo-nazis have been emboldened by reckless media that spread hateful headlines. Now these violent extremists feel that over half the country is behind them, and they’re taking their hate to the streets. Whichever way we voted in the referendum, we can all reject this racism, by demanding an end to hysterical and misleading headlines that whip up xenophobia. If enough of us call for it, we can make it untenable for newspapers like the Daily Mail and The Sun to fan the flames of hate, and editors will know their jobs depend on responsible journalism. “There ARE too many migrants”, “Halt the asylum tide now!”, “Migrants: How many more can we take?” -- all of these were splashed on the front pages of The Sun and the Daily Mail in the lead up to the vote. And now “Go back to Africa!” is being yelled at minorities in our communities after the ballots were counted. But none of this represents who we are as a people, no matter how we voted. These media outlets have mainstreamed racism and hate in the UK. Because of their irresponsible coverage the racist minority in the UK now feels emboldened. It’s why in the days since the referendum result, there’s been a 57% rise in reports of hate crimes. The media started this, and now they can end it by holding those responsible to account, and reminding the country that racism has no popular place here. We are less divided than we imagine, the UK is still a place that values community, connection, and humanity. The murdered MP Jo Cox once said: “we are far more united and have far more in common than that which divides us.” That wisdom was her legacy to us. Let's carry it forward. PS. Have you, or someone you know been a victim of racism? Report it on Facebook here or Twitter here.